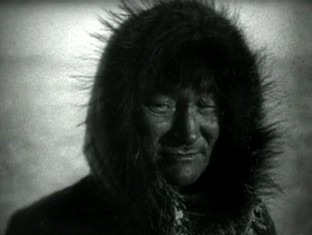 On my DVD of Robert J Flaherty’s pioneering 1922 quasi-documentary Nanook of the North, about the lives of the Arctic Inuit, I just saw a special feature I’d overlooked: a short black-and-white TV interview (probably recorded sometime in the 1950s) with Frances Flaherty, the director’s widow and occasional screenwriter. Though only 7-8 minutes long, it has some interesting material, especially in light of later controversies about the methods Flaherty used to depict the Inuit’s day-to-day existence. The interviewer is himself a documentary filmmaker, I forget his name, and the exchange is recorded in the studiedly informal style typical of the period. Gazing somewhere off-camera, Mrs Flaherty speaks in a measured voice. Interviewer: What are your thoughts on your late husband being called the father of the documentary film? Is that title misleading? Frances Flaherty: It has become misleading now, because the term documentary has come to be associated with short 16-mm films that are made for very specific sets of viewers. But Robert made his films as features, and for theatrical audiences – back then, remember, there were only theatrical screens. Int: Was Nanook of the North a commercial success? Int: Your husband started making films quite late in life, didn’t he? FF: Yes. He thought of himself as an explorer first and a filmmaker much, much afterwards. All art, he used to say, is a kind of exploring. Int: What kind of exploration was he interested in? 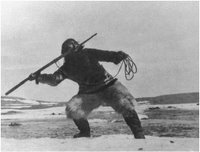 FF: His great search was for the spirit of people and their relationship with their environment, which is why he lived with the Inuit for long periods. He became fascinated with their lives. He used to say, “with fewer resources than any other people on earth, and living in a country where no other race could survive, they were still the happiest people I’ve met”. It’s difficult to miss the romanticism of this last remark, especially given that the real-life Nanook died battling a snowstorm (and starvation) shortly after the film was released. 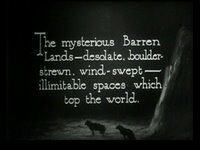 And sure enough, Nanook of the North is unabashedly idealised in places, starting with the first title card superimposed on a postcard image of the Arctic: “The mysterious, barren lands – desolate, boulder-strewn, wind-swept – the illimitable spaces which top the world.” (Love that “illimitable”!) But it’s also a deeply humanistic work, a genuine attempt to reach places that the “civilised world” knew very little of and to present distant lives in such a way that they became immediately familiar. Nanook begins by introducing us to its protagonist, the proud Itivimuit chief, in an unforgettable close-up (the shot prefigures Hollywood’s golden age and the cult of the movie star; this could be John Wayne posing heroically for the camera). We meet Nanook’s family: Nyla the Smiling One, the children, Comock the dog and a few baby huskies. We follow them on their summer journey to a trading post, “the white man’s big igloo”, and watch as polar bear and Arctic fox skins are exchanged for knives, beads and coloured candy. A series of disjointed episodes follow: Nanook negotiates perilous ice floes, catches fish with his harpoon, killing the bigger ones with his teeth; a walrus stakeout culminates in a ferocious tug-of-war between man and beast before the “Tiger of the North” is finally reeled in; the building of an igloo is capped by a luminous scene where Nanook makes a window for the house by carefully measuring and cutting an ice slab from the ground; the family goes to bed, rises, children are taught how to use a bow and arrow; a seal is captured; and the group narrowly escapes death in a terrible blizzard. 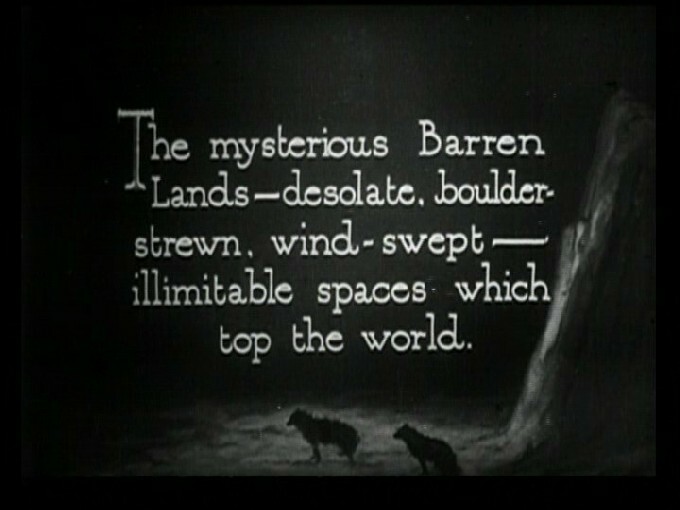 The film was acclaimed as the first full-length documentary, a claim that later led to controversy – for there were elements of artifice in the actual shooting. 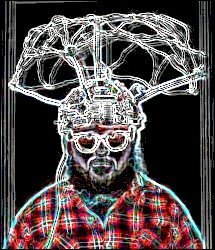 For starters, Flaherty’s intention was not to present these people as they really were at the time the film was made but at an earlier, more primitive time when they had not yet acquired shotguns and motor-operated kayaks. Accordingly, these modern tools were kept out of the camera’s range. At one point during the tug-of-war with the walrus, when things get difficult, you can briefly see one of the hunters turning around and shouting something at the camera. (“Throw me that gun, you idiot director”?) Even a casual viewer can make out that a couple of scenes (such as the seal-hunting one) could easily have been staged, and apparently some of the members of Nanook’s family were paid actors (though equally importantly they were real Inuit, who did live in these conditions). I don’t see how any of this affects the film’s essential integrity; you’d have to be a rabid literalist to condemn it on these grounds. None of the artifice can detract from the larger, more important truths about Nanook of the North: that Flaherty took his bulky shooting equipment to this inhospitable (and at the time, extremely difficult to access) part of the world, spent months living with and observing the Inuit, and constructed a (partly fictitious) narrative around the very real possibilities of their lives. The Arctic landscape isn’t a giant prop. The dangers of hunting are real, as are the hunting methods, the savage dogs and the details of communal living. And that really IS an igloo being built from the ground up (though the interior shots were filmed inside a specially constructed igloo with one side missing, so Flaherty’s camera would get the light it required). It was then that Flaherty hit upon the idea of using a single character and his family as representative of the Inuit, and so Nanook, a film with a definite narrative trajectory, came into being. The implication is clear: at some point, Flaherty had to choose between unblemished authenticity on the one hand and the requirements of good filmmaking on the other. He had to sacrifice a few literal truths for deeper, more poetic truths. The results of his decision are there for anyone to see today. You can’t deny the simple power of some of these visuals, more than 80 years after they were captured on film. 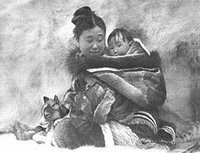 My favourite scenes include the Inuit family emerging one by one from a kayak’s underwater interior, Nanook reaching into an underground trap and pulling out a white fox, the droll shot of the “sentinel walrus” looking about for signs of danger while its mates sleep, and the haunting images of the dogs howling in a snowstorm at the very end. Flaherty’s tireless quest for the spirit of a people comes through in every scene. “I have a theory about the film’s success,” his wife says at one point in the interview, “I believe that when Nanook and Nyla and the other Inuit smile at us from the screen, we smile back – at that moment all the differences between us fall away and we become one with all people.” This is again a slightly ingenuous remark (I’m not sure that all cosmopolitan viewers around the world would have felt deep kinship during the scenes where Nanook and his family bite into raw seal meat and grin up at the camera with blubber on their lips), but it’s a remark that fits in with Flaherty’s own idealism. The film is a testament to his faith in the deep connections between people everywhere, and his then-revolutionary attempt to use the movie camera to bridge cultures. P.S. 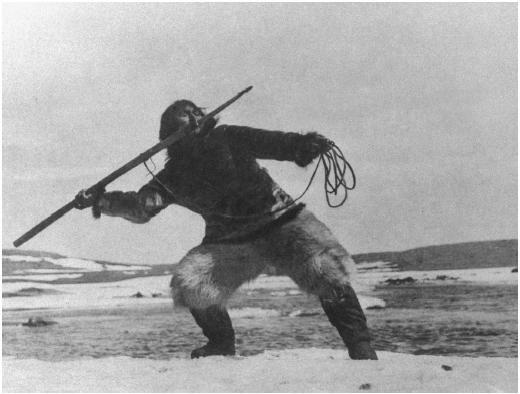 Here's an essay by Flaherty: How I Filmed Nanook of the North. did the interview say nothing about how flaherty lost all of the footage he originally filmed, and how the nanook we know is actually a second version? the film - an older variety of emulsion - burnt up, destroying all the negative. (the essay you pointed to mentions it right at the beginning). my favourite bit is when the wife chews nanook's shoes to soften them up. we were all very, very outraged when we saw that bit! heh! A few years back I was reading a serialization of Satyajit Ray's diaries by his widow in a Bengali magazine. There is a description of how the Rays met Mrs. Flaherty in their first US visit, & she had some very good things to say about Pather Panchali. My father loved Nanook. I think it was the first movie he ever raved about, when I was just a little kid in Calcutta (with nowhere to see the movie!). Apparently it used to be quite a hit in the film society circles back in the day. Flaherty has another Indian connection in that he co-directed (with Alexander Korda's brother Zoltan) our desi actor Sabu's British debut, The Elephant Boy. Hadn't heard of this film. 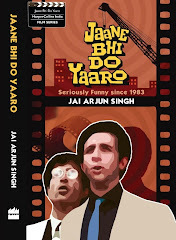 Shall now see if I can get a copy of the dvd. "He had to sacrifice a few literal truths for deeper, more poetic truths."